From last week's finery at the Waterfront Cafe to less fancy fare at the much more mainstream Georgian Coffee House in the Thoroughfare (see map). Signs by the hanging baskets outside proclaim "light meals, table service, licensed". Slightly delayed by fun and games bagging a parking spot by the library, so glad that AC, Mr Punctuality, had already bagged a table for us, 'cos it was busy-busy. Lots to choose from but no particular hurry: only appeared to be the one poor waitress attending to the inside, conservatory extension and the outside tables, yet still she kept smiling and serving. Meantime we played spot the difference with the official place mats that depict the cafe -- there's obviously more than one version of the artist's etching, and it kept us amused. Ooh, must make mention of a big plus point: newspapers! Dear cafe owners, please take note and do as the Georgian does. Put aside a fiver each day and purchase (a) couple of broadsheets, (b) couple of red tops and (c) local paper too. You know it makes sense. Quick flick through the Independent and the food was with us. Nice bacon and cheese toasted sarnie with an obligatory Orangina. Fellow diners' ciabatta and salmon tagliatelle looked good too. Various cottage pies and lasagnes being being consumed around us. Plenty of cake-shaped room left for afters. Up to the front to be talked through the diverse display. What's good? It's all good. Cheesecake, tarts, big wedges of chocolate cake, you name it. Long-suffering waitress duly obliged, eventually, also bringing proper strong coffee. And so back to work. 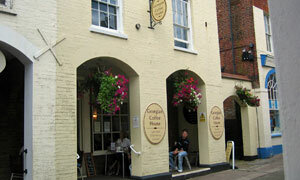 Website: The Georgian Coffee House. If it was a car -- Vauxhall Zafira. If they were passing by -- Griff Rhys Jones.